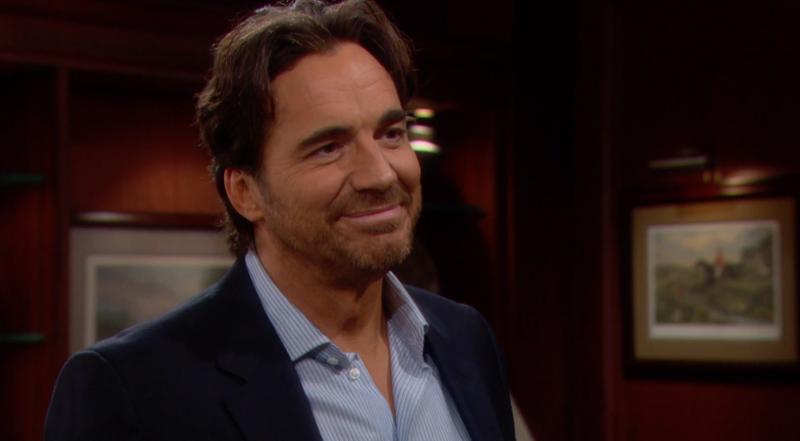 Ridge (Thorsten Kaye) saw his world collapse when the truth about Douglas was revealed by Katie. HOLLYWOOD—At long last, the secrets that have been kept under wraps for months have finally surfaced on the CBS soap “The Bold and the Beautiful.” Some of the most riveting acting I’ve seen in the past year has taken place in the last week. For starters, Julius’ secret made waves in the Avant clan. Watching those acting scenes between Sasha (Felisha Cooper) and Nicole (Reign Edwards) as the bombshell came to fruition was such a treat. I never expected such range from Cooper, but she indeed showcased that she is much more than just a pretty face. Nicole was floored to learn that she had another sister that was secretly under her nose her entire life, when she took the news to her father; he was still scrambling to cover his tracks. I swear Obba Babatunde is a phenomenal actor. He just won an Emmy award for Outstanding Guest Performer, and I would make the argument that he is a front-runner for the award again in 2017. Not only did Sasha and Nicole let dear ole dad have it, but Vivienne really tore into her husband about his betrayal. Watching those scenes with Anna Marie Horsford was riveting. I mean she lashed out at everyone. I’m just eagerly waiting to see how Maya responds when she learns of her father’s betrayal and the fact that she has another sister she has no idea about. Julius’ world has indeed come crashing down, but now it appears the Sasha, Nicole and Zende love triangle is about to become even more complicated. So just which sister will capture Zende’s heart? News is indeed surfacing that Sasha could be pregnant with Zende’s child. Hmm, that looks to make the narrative of this family a bit more frustrating. I can’t help but wonder what will transpire with Julius and Vivienne though? Could a reunion be in the works, or has the matriarch taken all she can take from her duplicitous lover? The biggest bombshell finally came to light last week courtesy of Katie Spencer. Yes, I will admit I’m a bit frustrated by Katie dabbling in this storyline. Doesn’t she have something better to do besides worry about what the hell everyone else is up to? I mean Katie of all people to discover that Thomas is the father of Douglas and not Ridge was just so underwhelming in my opinion. I will acknowledge watching Caroline having a mental breakdown when she suspected Ridge spilled all the details was riveting. Katie being holier than thou made it clear to Caroline and Ridge that if they didn’t spill the beans, she would have no problem doing so. So that only led to Ridge having that talk with his son where Thomas put 2-and-2 together realizing that Douglas is indeed his son! Thomas was stunned to learn the truth, just as Caroline was an emotional mess. Ridge was headstrong in making it clear to Thomas that Douglas was his son, not Thomas’. I mean Ridge seriously expects Thomas to move along with his life after discovering he has a son. Who in their right mind would allow their own father to raise their child as their own, when in truth the kid is their grandson? Prepare for a custody battle because its apparent Ridge and Thomas are about to duel for custody of the little one. Has Thomas grown in the past few weeks? Of course, but is he ready to be a father, I seriously think not. I must admit Ridge’s calm demeanor during the reveal left me slightly stunned. Thomas should have been shouting through the roof, but instead, he was in a state of shock, but still firm in his belief that Douglas was going to be raised by him and no one else. Well, he did go off on the deep end, as he took Thomas from Ridge and Caroline without them knowing and looks like he might be on the run. Caroline is a mess, and so is Ridge cause who knows what he might do. Of course, we have the ever-evolving tale with Liam, Steffy and Wyatt that has been so drawn out that it is no longer interesting or fun to watch. A love triangle for a few weeks is intriguing, for a year or longer, is just plan boredom. Its time, its time people, to make a choice and let hearts break and end this triangle that is continuing to be shoved down our throats. Steffy is now at odds again; she loves Wyatt, but for some reason she is still attracted to Liam. Hey, you married Wyatt, if you had any doubts, why the hell would you marry him in the first place? This might be one of the craziest narratives the writers of “The Bold and the Beautiful” have cooked up in weeks. I mean Liam has an intense confrontation with Quinn who kept him hostage and slept with him. Suddenly, it looks like Liam has feelings for this psychotic woman, while his father Bill wants to kill her. Sweeps have kicked off and the drama is only heightening at Forrester Creations. Previous articleWentworth Miller Keeps Winning! Next articleFlirting With A Return To School?